Featuring pieces created by Benjamin Thiebault, Luka Batista, Sander Notenbaert, Nuno Lobo, Mari Pepa Contreras and Rafael Reina. Each creator uses techniques from the programme Contemporary music through non-western techniques in his or her own way, mixed with their own style and/or aesthetics. Each piece is therefore completely different from another and quite unique. 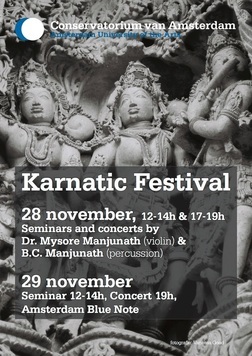 ​In the seminars on 28 and 29 November, Dr. Mysore Manjunath (violin) and B.C. Manjunath (percussion) will explain key principles of Karnatic music as well as concepts, phrases and talas that they will use in their concert on the 29 November. They will also propose practical exercises for the students. ​The first half of the double-bill concert features pieces of the programme Contemporary music through non-western techniques, created and performed by students. In the second half, the two Karnatic musicians perform new pieces using constant crossing accents, polyrhythms and polypulses. Unusual and complex talas will be the trademark of the concert. 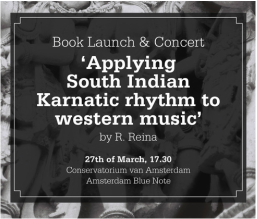 The launch of the book ‘Applying Karnatic Rhythmical Techniques to Western Music’ will feature a special concert with compositions written by myself and advanced students of the programme ‘Contemporary Music through Non-Western Techniques’.